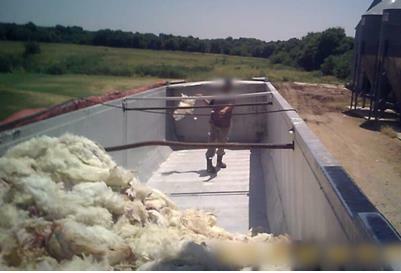 Following an intrusion of an Oklahoma facility owned and operated by Mahard Egg Farm in 2018, the animal right activist organization posted videos of alleged improper handling of hens during flock depletion. According to news reports, the supermarket chain suspended Mahard as a supplier but has since resumed sourcing eggs from the operation following a review. In a PETA press release, the organization stated "Kroger continues to sell eggs from Mahard and has refused an offer of joint visit to its supplier's farms to assess the animals living conditions." A Kroger spokesperson said "In response to the adverse publicity, Mahard developed a detailed corrective action plan which included re-training of all their employees on proper animal care techniques." Mahard passed the United Egg Producers audit and has taken appropriate steps to meet the Kroger requirements, and accordingly the chain is purchasing eggs from the operation.